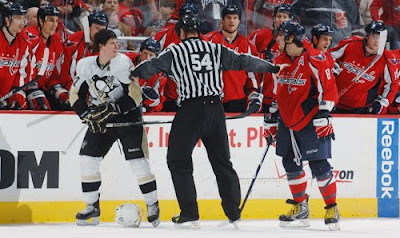 Hockey Plumber: Trade Deadline 2010: Washington Gets Better... or Worse? Trade Deadline 2010: Washington Gets Better... or Worse? Many believe that the team in the East that did the most to help their chances of winning a Cup, at (or near) the deadline, was the defending Champion Penguins. they addressed their top needs by adding depth on defense and a top six winger... and gave up relatively little to do so. Washington, who took Pittsburgh to a game seven last season, leads the East by a wide margin, but certainly must have felt pressure to shore up their needs. The Caps entered the day looking to add some grit to their blueline and some defensive ability up front. 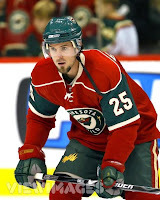 By acquiring forward Scott Walker from Carolina for a seventh round pick in 2010, and then adding another forward in Eric Belanger from Minnesota for a second rounder, the Caps got a pair of excellent defensive minded forwards that can do a little of everything. Considering that they did not have to give up a roster player or even a prospect to do so, makes the deals even that much better. However, GM George McPhee made two more trades for the blueline that left us scratching our heads. First, they re-acquired defenseman Milan Jurcina from Columbus for a sixth rounder. 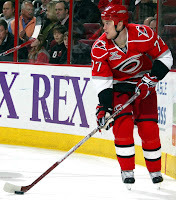 Then they swung a deal for Joe Corvo with Carolina for defenseman Brian Pothier, prospect forward Oskar Osala and a 2011 second round pick. Regardless of what ones opinion might be of the players and picks that they traded to get these two... we ask, how do Jurcina and Corvo help Washington? Jurcina was traded away earlier this season because he rarely uses his imposing size and makes poor decisions in his own end. As TSN's Pierre McGuire stated when they announced the deal, "There is a reason he is called 'Oh No' Corvo." What ever talents Corvo brings to the ice, he is notorious for his huge mistakes. Additionally, because they did not move any of their current roster forwards today, Washington will have to sit some of their talented group to put their acquisitions on the ice. In the end, the Caps will win by outscoring their opponents down the stretch and in the post season. Only a Cup will suffice this team. Did they get better or worse today? The hardware they collect or fail to collect will provide the answer. Ok, yes, I completely agree with Milan Jurcina and Joe Corvo being bad pickups. Especially when they lost Oscar Osala, who for some reason looks real promising to me. But the Scott Walker addition was great. Adding Mike Knuble in the off-season really worked out well, and I'd say Walker is a similar kind of player. I think what's more important for Washington than all of this is if Varlamov can play mighty well down the stretch run and into the playoffs, or if Mike Neuvirth can get hot. Cause if Joe is "Oh No" Corvo, then Jose is "Theo-open-dore".